Spring is coming! In some places, it may not feel like it (Midwest, get with the program), but I promise, it’s coming. It makes me get all excited for outside play! My kids are finally at the age where I can send them outside to play without needing to go with them. Summertime is full of tons of playtime opportunities. Sometimes it’s nice that those playtime opportunities are right in your front or backyard. Sidewalk chalk games are a great way to keep your kiddos thinking during the summer months and also keep them active! You can even do these sidewalk chalk games in the Spring time when it starts to get a little nicer out! Play dough mats are a great way to manipulate dough into shapes and also learn a little bit during the process. They’re a great activity for kids who like to learn with their sense of touch. 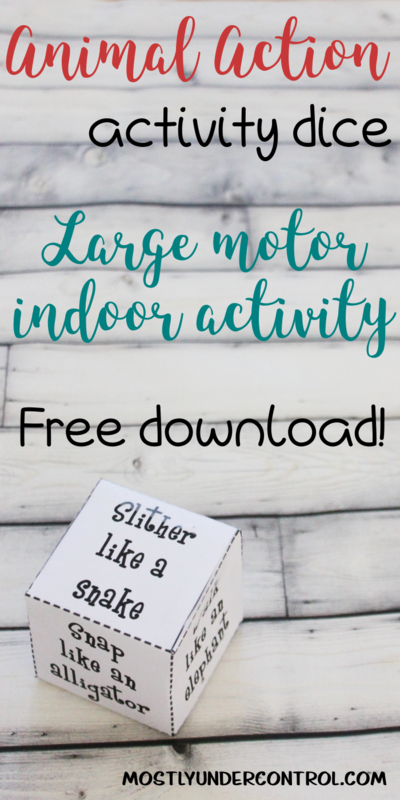 Here is a printable for you with letters of the alphabet and numbers! I don’t know about you, but my kids love play dough. They love to push and pull the dough to manipulate it into shapes they like. I think most of the time they don’t even have an end game in mind and that’s ok! 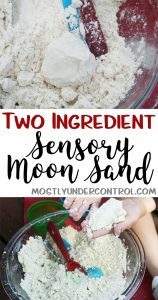 2 Ingredient moon sand is so ridiculously easy – much like most of my activities you can find here! You probably have the ingredients on hand and it can be made in seconds. 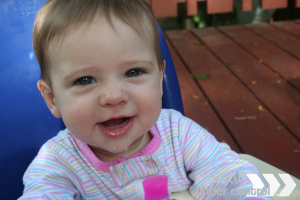 Give your kiddo a bowl of it and let them go to town! 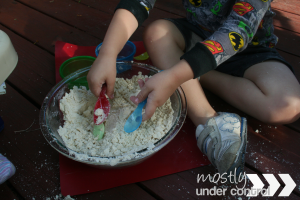 Ohhh sensory play. 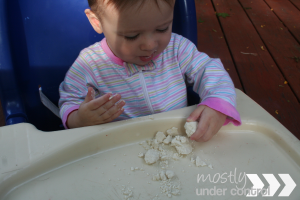 Sweet, sweet sensory play. Just when I think I am going to do an activity that does not involve sensory play, something comes to mind from when I was teaching. And I can’t. Pull. Away. When we played with this stuff, Dylan of course turned it into good guys and bad guys (because he’s a boy. And 4 years old). But he asked me to help him roll them into balls so he could cut them open with the plastic utensils I gave him. He also really enjoyed making it with me. He loves to measure things out and count with me. He especially loves pouring the ingredients into the bowl. Please pay no attention to our outfit choice. He woke up wet so he was running around in a shirt and new dry underwear. I told him if he wanted to go outside, he had to put pants on. So he kept his pajama shirt on. Whatever. Something that he mentioned during this one though that he never has was how it smelled. I think he really enjoyed the baby oil smell. I also added a few drops of a “Cheer Up Buttercup” essential oil blend. It smelled really good with the baby oil. We were watching my mom’s dog and my sister’s dog when we did this activity. My mom’s dog really loved eating it. Like, really loved eating it. It was gross. I had to put him inside because he was having way too much fun eating this flour. He’s a strange, strange dog that will pretty much eat anything and will fight you for it. Actually, he’s a lot like Reagan. Mix everything together with a spoon or your hands. I found it a lot easier to control with my hands. If you need it to be a little more wet, just add more baby oil. Reagan snacked on it also. I don’t recommend this. I kept taking it out of her mouth and trying to redirect her but it was a lost cause. I promptly took it away and she got a sippy cup instead. Obviously she’s bothered by it. 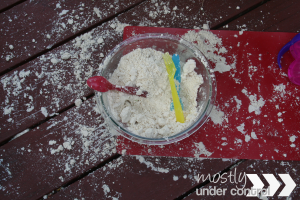 This was the aftermath – definitely an outside activity. Looking for a great rainy day activity? DIY slime is sure to keep your kiddos busy when they can’t get outside for the day. 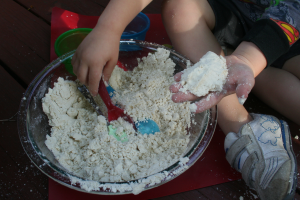 It’s sensory play and when you add things to the slime, it’s perfect for imaginative play!